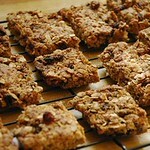 A giant list of DIY recipes: maybe you’ll find a new thing to make? But first, a discovery! 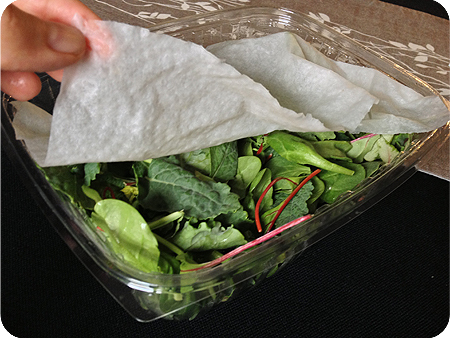 Did you know that if you tuck a wet piece of paper towel inside those plastic green containers that normally house baby greens they’ll stay crisper longer? I’m VERY happy my package of baby kale and chard is looking so good! Going the DIY route on most of these items doesn’t actually take a whole lot of extra effort. There are a few things that take more work in the grand scheme of things (I’m thinking specifically of lasagna – all that chopping – this is a labour-intensive dish!) but it doesn’t actually take long to make your own taco seasoning for example. Or salad dressing. And what’s more, if you make it yourself you are 100% in control of what goes into it… which is the best reason of all to make your own. Dish soap (“from soap bars – smells nicer and is cheaper”) Here’s someone who has a good recipe for dish soap. Shake n’ Bake … or as I like to call it, Shake n’ Sodium. Here’s my fave recipe. If you have a great recipe for any of the above, or would like to add your own thoughts about things you make instead of buy, please leave it in the comments below! 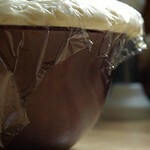 Share the post "A giant list of DIY recipes: maybe you’ll find a new thing to make?" 15 Responses to "A giant list of DIY recipes: maybe you’ll find a new thing to make?" Love these! I do try to make as much as I can and finally made my own taco seasoning a few weeks ago. Tastes great and so easy and I control the sodium! I make many of these things myself, and just recently added tortillas and laundry soap to my repertoire. Homemade tortillas are so good and so easy, you’ll never buy them again! If I can make laundry soap, I can make dish soap. I’ll do that next! I make more and more stuff myself. I like this list. And as the one who listed Lasagna as my always home made item. It is so easy. It really isn’t that much work and it makes wonderful left overs (BTW I don’t precook my noodles, just add 1.5 cups of water to the sauce and they cook at the same time). We had one just last night. ok one question. A lot of home made cleaning (on pinterest and all) uses Arm & Hammer Super Washing Soda. I have yet to find this in Ottawa (I have looked at my local Walmart super centre and Superstore). Is there a local source for this stuff? Great post idea! Love all the ideas! We do (or have done) most of these! I love our DIY cleaning products – mostly vinegar and water for cleaning with a drop of tea tree oil. The year I was on mat leave I made powdered laundry detergent regularly. To those looking for washing soda – check Canadian Tire and Sobeys in the laundry or cleaning isle. I make handsoap with lavender Bronners castille soap and water in foaming pumps. Another favorite is popcorn kernels in a regular paper bag (sealed) in the microwave. For the most part, food is mostly DIY in our house because our son has food allergies. 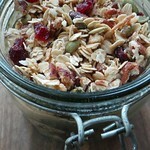 Most convenience items contain milk or soy so out for our family meals! Can’t wait to hear more ideas! No one said ice cream! We never buy ice cream anymore. We bought an ice cream maker and now we eat less but much better ice cream. Lasagna requires a lot of chopping? What on earth are you putting in your recipes? Very, very curious now! I make a lot of things because they have to be gluten free. Some things simply aren’t available otherwise, such as girl scout cookies (I grew up in Europe! ), croissants and pita bread. I am not a fan of canned stuff (I taste metal) so I can my own fruit & tomatoes (also, I’m allergic to pineapple so this is the only way I can have canned fruit salad, which I still like!) I mostly make my own salad dressing and always make soups. But my attempt to not buy my bread fell by the wayside; there are some things I find easy (eg chocolate mousse, and I have never understood pancake mix; so few ingredients already!) but others that make me tired to contemplate (muffins, bread), so they don’t happen that often. One of our housemates thinks that cooking bacon is so exhausting that he’s willing to eat the precooked stuff, but will sauté mushroom slices one by one. So interesting what people find easy and hard to make at home! I think the only thing I make that’s really unusual is that I make our own Christmas crackers, including the paper hats and the favour inside. Mostly because my family insists on crackers but I haaate the cheap plastic toys. We’ve tried making hot chocolate powder but totally not a hit. We keep trying though. I’ve always wanted to try making yogurt. Maybe this week I’ll finally do that! I make apple turnovers using sauteed apples and phyllo dough. Got a first time batch of home made vanilla extract maturing in the cupboard right now. Our home made tomato juice beats the pants off anything store bought. Have not bought jam in a store for more than a decade. You guys make GREAT stuff. I totally forgot about ice cream! And I looooove the idea of making my own Christmas crackers. I too hate the crappy toys that come in the grocery-store variety. It is perfection in the morning with some fruit and either milk or yogurt! I’ve been making my pizza dough and pancakes from scratch for a while now, but now I’ve stopped buying English muffins. Instead, a couple of times a week I bake English Muffin Bread, which you slice and toast – it’s perfect: crispy on the outside and yielding and chewy on the inside, depending on how thick you cut the slices. I use this recipe as a base: http://www.kingarthurflour.com/recipes/english-muffin-toasting-bread-recipe BUT I’ve played around with it and its best if you use bread flour rather than all purpose (though all purpose works), and cut the salt in half, if you use 3/4 of a teaspoon rather than 1.5 (!) it tastes better and it still rises well. My girls like it toasted golden brown with butter and jam. I love the list! and will come back to it to try a few recipes. 2. Nut or seed butters – toast the seeds or nuts and smash up in food processor (or vitamix), you’ll probably need some oil, my favourites right now are coconut or avocado (and no it does not taste like guacamole, it is a very neutral and good-for-ya oil), and run the machine until it’s smooth enough to spread. You can customise! add honey! or cinnamon! – recently I did an almond/pumpkin seed butter with carob, cinnamon and coconut oil and yumsters. Actually, I might just go ahead and say that I love love the vitamix (no they didn’t slip me a fiver to say this) and having it makes it so much easier to make stuff at home. I love that you put this list together. I’ve been making my own laundry detergent for a while, but I go through stages on hating it…I really need to find the best recipe…I’ve tried a few now. And I’ve been thinking about making my own dish washer detergent, but dish soap I didn’t even think of! That’s next for sure. Chantal asked in her comment about Washing Soda and I buy mine at the Independent in Barrhaven. Before we moved I got it at Walmart or Canadian Tire but they were always hit or miss. how ironic. i was just reading about the damp papertowel in the spinach container. i started putting the romaine lettuce in one a few months ago and voila..i read it on your site. it really does work. i put my celery in there to. EASY BABY WIPES: I did mine similar to cloth diapers. I bought a bunch of baby washcloths and would keep a couple of dry ones with me in a ziploc bag wherever I went (more if I was going to be gone longer), and kept an empty ziploc bag with me for dirty ones. When it was time to use them, I would just wet them with warm tap water and throw them in a ziploc bag until I got home, or in with the cloth diapers when I was home. I got REALLY good at cleaning up most diaper messes with just one wipe! Launder with cloth diapers, or in the hottest water possible by themselves since they are contaminated. A good way to get the water REALLY hot: pour a large pot full of boiling water right into the tub on top of the wipes. With this method I NEVER had a problem with smells or anything else. I could usually find a pack of baby washcloths at the dollar store in a pack of 4 or 5. It was great! 2013-04-25: Can you live below the line?